The Gift is from a larger body of work that documents my journey through grief after the loss of a loved one, and the lingering effect these emotions have had upon the way I perceive the world. In July 2015 I had my first close encounter with death through the passing of my grandfather. I was with him when he passed away, one of the most profound experiences of my life. It was traumatic, it was surreal, it was humbling, and in some ways it was also a privilege. Surely it must be one of the most intimate experiences you can have with someone, to be with them at what is possibly the loneliest and most vulnerable moment of their lives, when they can only cross over that final threshold completely and utterly alone, leaving the rest of us behind to process what has just happened. Soon after I had a residency in Mildura, Australia, where it just so happened my grandfather had been born. It was my first visit to his beloved home country, and when I discovered the apocalyptic landscape near Kings Billabong it seemed to reflect my anguished state of mind. Ancient twisted trees, once huge and majestic, ravaged by salt and drought, reduced to pale corpses twisting in agony as they strove to reach an ever-receding water line. They reminded me of my grandfather in those final hours, fighting so hard to hold on. Ever since I have analysed these emotions over and over again in my work, and I have come to discover that even in death there is a strange and terrible beauty. 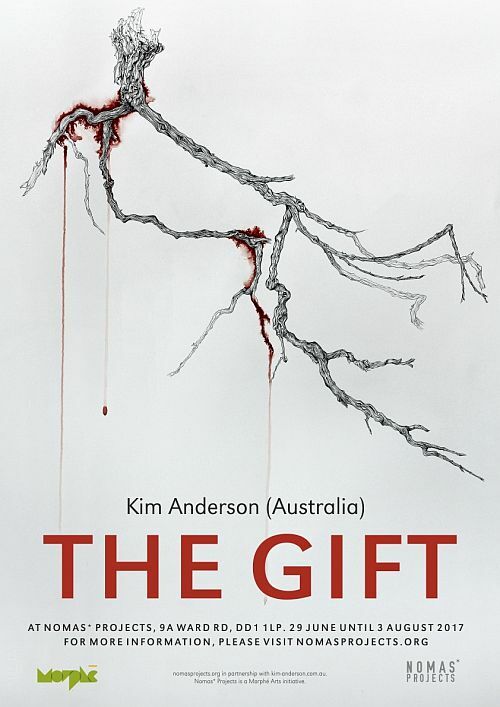 Kim completed a Bachelor of Fine Arts (First Class Honours) at the University of Ballarat Arts Academy in Australia, and in 2007 was awarded a scholarship to study a Master of Fine Art at Duncan of Jordanstone College of Art And Design in Dundee. 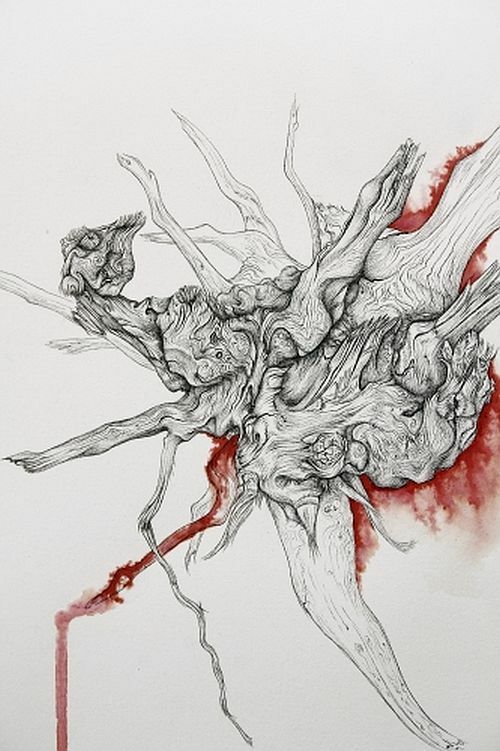 Since graduating from DJCAD in 2008, she has undertaken residencies around the world including Hospitalfield House in Arbroath, Scotland, an Australia Council International Studio Residency at the British School at Rome, Australia House in Echigo-Tsumari, Japan, DRAWinternational in Caylus, France, and a number of residencies around Australia. She has exhibited extensively around Australia and internationally, and been a finalist and recipient of numerous awards. 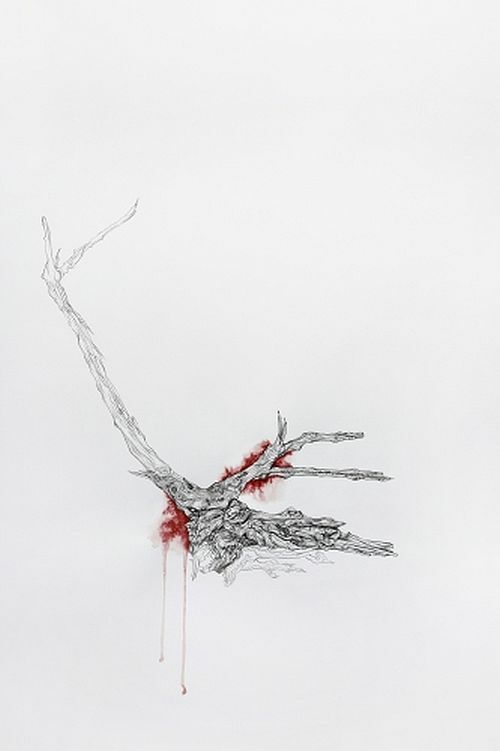 Along with more traditional works on paper, she has created large-scale site-specific ephemeral drawings, visual/sound installations, and curated many projects by other artists. Alongside her artistic practice, Kim has had a curatorial internship with Deveron Arts in Huntly, Scotland, been a committee member of Artist Run Initiative Space 22 in Ballarat, Australia, tutored in Art Theory and Drawing at the University of Ballarat Arts Academy, and she is currently an Associate to the Board of the Ballarat Arts Foundation as a member of their Grants Committee. She has also been curator of the Skin Gallery in Carlton, Melbourne, an initiative between Arts Access Victoria and the Skin and Cancer Foundation Inc., where she presented solo and group exhibitions by artists living with disability.